The Food Disruptors deconstructs the unholy hash of economics, culture, and science that make up what, why, how, and where we eat today. However, I was confident that I knew where to look, what to read, and could learn on my dime. I did. This site was built from the ground up. The ask was for a podcasting site with modern technologies built into it, and one that the owner can maintain and update as needed. There were some challenges regarding storage and simplicity but the mission was accomplished for a very satisfied client. Recording is taking place in April of 2018 with a target “First Podcast” date in May. The site’s blog function allows the owner to simply attach the sound file in a post and write some content. 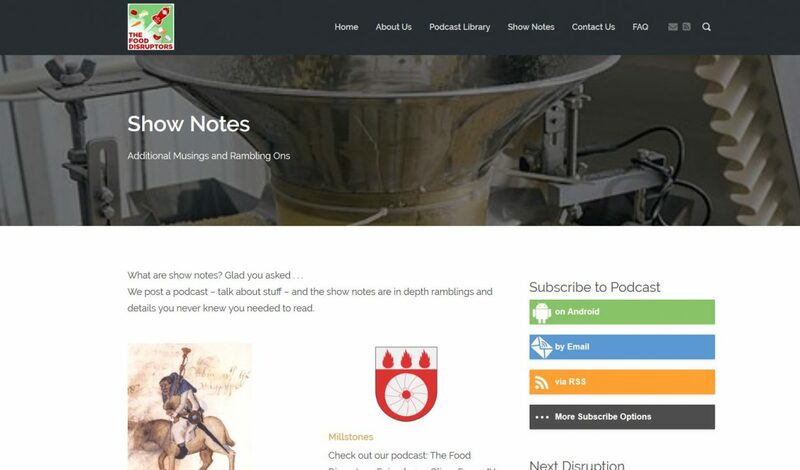 The backend creates a catalogue and pushes the podcast out to various platforms. The stream can be heard on a variety of channels including iTunes Internet Radio and Apple TV, TuneIn, Sonos, SHOUTcast, Aha Radio, Android and Kindle Fire devices, Xbox One, Bose and more. In addition to website statistics, podcast statistics that measure downloads and plays as well as geographic reporting and traffic sources are provided.